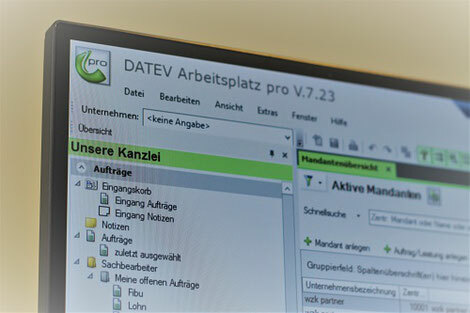 We are members of DATEV, the leading accounting software used by accountants and tax advisors in Germany. In the recent years DATEV has increaded efforts to supply online accounting software for companies that allows for a good cooperation between the company and its accountants. Especially, DATEV Unternehmen online allows you to upload accounting information, that can then be processed by us. You have full access to reports - wherever you are. Online accounting services - in the course of the increasing digitization, the DATEV software "Accounting Online / Unternehmen Online" opens up the possibility of exchanging and recording documents for payroll accounting and financial accounting. The internet application DATEV "Accounting Online / Unternehmen Online" does not require any additional software installations. Clients scan the documents and transfer them to the DATEV data center. The digitized documents are available centrally for the clients and the accountants/tax adviser. The accountants transfer relevant booking information directly to the data center from where all information can also be used by the clients. Also, the accountants can provide the clients with all sorts of business reports online. Thus, clients always have up-to-date evaluations for controlling purposes or even consider a complete outsourcing of the accounting function. Numerous documents are already digital today. There is no need to print out these digital documents. All documents remain with you. No pendulum folder has to be maintained and sent to the accountants. Simple, internet-based application (no program installation / administration / data backup on site), which is secured with a smartcard & password. The accounting is always up-to-date. Once you have sent the scanned document to the DATEV data center, it can be recorded. Receivables and payables can currently be monitored. 24-hour access to your entire accounting reports, as well as your payroll statements and payroll data. Online document archiveallows to display the required document as an image. Electronic invoices can be archived very easily in a revision-proof / financially secure manner. Electronic payment transactions can be conveniently handled through online accounting. You have a current list of payment proposals at all times. Low requirements for the required hardware. Our accounting staff is based in Munich/Germany.